As Part 1 of this article already revealed, having pets carries enormous health benefits and can generally help improve mood and ease pain, whether you own a dog, cat, horse or reptile. In the second half of this post, we are looking at how pets can benefit children by supporting their social, physical and emotional development and strengthening their immunity for better health as they grow. The remarkable power of animals also supports child learning in more ways than one, helping to improve concentration and developing key social skills and compassion. Many studies have been conducted to address the effect of animal companionship on children during their early development, and the results have consolidated years of theory about the benefits to emotional progression. Children who are brought up with animals in the home are thought to display kinder, more patient and affectionate behaviours than children brought up without them. This also extends to children with autism and Attention Deficit Hyperactivity Disorder (ADHD) who may struggle relating to others or expressing themselves. This can be very frustrating and may even excerbate the behaviours. Dogs have an incredible capacity for fulfilling this need to communicate and enhancing feelings of confidence and self-worth. 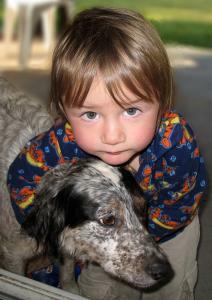 Introducing pets to your children early on carries an additional benefit. Doctors have studied the relationship between allergies and the presence of pets in the childhood home and concluded that living with animals – on a farm, for instance - can significantly reduce your chances of developing allergies or having a weakened immune system when young. So you get to enjoy the company of your beloved pets and grow up free from any allergies in adulthood – bonus! Improving immunity is a serious health benefit that can go towards safeguarding your entire family in the future. Another benefit of owning a pet, particularly a dog, is that it can help you socialise, which might initially seem nonsensical but actually, provides you with ample opportunities for meeting people and getting out and about. Walking your dog could lead to new interactions with other dog owners and this shared interest will make for a great conversation starter. Many report that the need to exercise their dog gives them a purpose in life and helps keep them active and socially engaged. Exercising your dog also exercises you, and the best running partner is often the one at the other end of the lead. In helping you keep active, your canine companion is assisting in lowering your cholesterol and improving your physical health. In turn, this will lead to fewer strokes and heart complaints. More interestingly, specific cases have suggested that dogs are able to detect the compounds of cancer on their owner’s breath, helping to diagnose symptoms in their earlier stages. Research carried out in America and Germany has found that a dog’s acute sense of smell is able to identify subtle traces of organic compounds; whilst the studies conducted have found a strong link between lung cancer cases and canine detection, dogs have also been found to recognise compounds associated with breast and ovarian cancers. Due to the many confounding variables in breath analysis, training dogs specifically for this purpose is difficult, requiring many samples, not just of cancer breath but of healthy breath and breath that may have traces of other diseases present. In the future however, dogs may be more widely used in the diagnosis of human cancers, or their powerful sense of smell may be replicated in a medical breathalyzer. The capabilities of the canine species are unprecedented and they are constantly excelling in the world of human health care. From providing comfort and companionship to isolated or unhappy individuals, to lowering blood pressure, improving immunity and detecting life-threatening diseases, the dog does it all, without even knowing! It is not only dogs that benefit our health but our furry and feathered friends also, helping to improve our quality of life every step of the way. We got our puppy late last year after doing a course with PAWS and Dogs for the Disabled as our 9 year old son has Aspergers - Oscar is now 11months and they are the best of friends. Getting our miniature schnauzer was the best thing we ever did.